Between these two Twitter feeds, there are 10,000 followers. When I saw that they had retweeted my story, I expected a flood (or at least close to 100) hits coming through the link to my most recent paper, The Cloud and Africa – Indicators for Growth of Cloud Computing. Alas, not a single follower (according to WordPress’ statistics) of those twitter feeds clicked on my link to read my paper. The reason I had been so excited about this paper was the originality of the idea. I had never written a paper that was so quantitative heavy, but I had to go that route after I found the literature of Cloud Computing to be limited in the development sense. The few mentions of cloud computing in developing markets focused on India and China. So with the limited amount of data, I had to hypothesize and use what I had learned in class to make a prediction. One of the biggest things I’ve learned while being back in academia the past year is the proliferation of the fear of prediction making. So I decided to buck this trend and create a database that would predict which countries in Africa were most likely to embrace cloud computing as a development and economic solution. 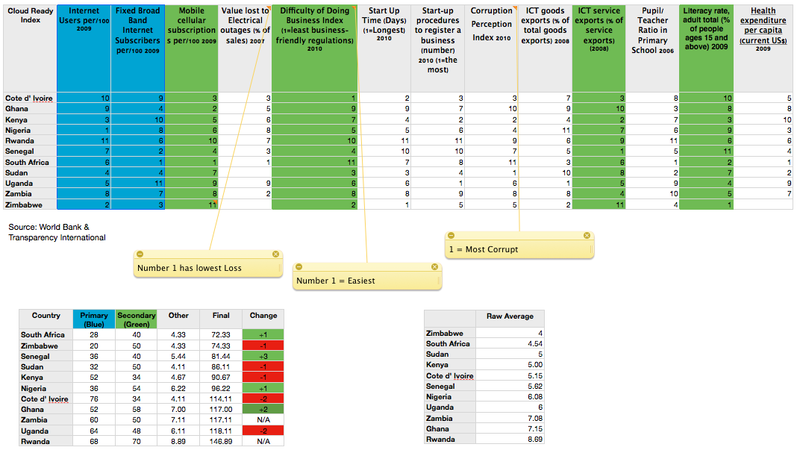 What resulted was a table that formed the basis for my Cloud Readiness Index. Certainly, it is not anything that would withstand academic review, but something I thought that could be a good conversation starter and one that could provide information to policy makers and businesses on which markets to examine further to determine if they would adopt the model of Cloud Computing. My class presentation is here. The table can be seen here.